"No man is a hero to his valet." - Mme Anne-Marie Bigot de Cornuel (1605-1694). A BUTLER is a domestic worker in a large household. In great houses, the household is sometimes divided into departments with the butler in charge of the dining room, wine cellar, and pantry. Some also have charge of the entire parlour floor, and housekeepers caring for the entire house and its appearance. A butler is usually male, and in charge of male servants, while a housekeeper is usually a woman, and in charge of female servants. Traditionally, male servants (such as footmen) were rarer and therefore better paid and of higher status than female servants. The butler, as the senior male servant, has the highest servant status. He can also be sometimes used as a chauffeur. In modern houses where the butler is the most senior worker, titles such as majordomo, butler administrator, house manager, manservant, staff manager, chief of staff, staff captain, estate manager and head of household staff are sometimes given. The precise duties of the employee will vary to some extent in line with the title given, but perhaps, more importantly in line with the requirements of the individual employer. In the grandest homes or when the employer owns more than one residence, there is sometimes an estate manager of higher rank than the butler. Meet the world’s first robotic butler - USA Today. The Remains of the Day - actor Anthony Hopkins as the butler of Darlington Hall Mr. James Stevens. Rich Chinese, Inspired by ‘Downton,’ Fuel Demand for Butlers - The New York Times. The Domestic Staff Citizen - "Exploring Household Team & Organizational Development." Since 2010 has provided inspiration, review, and promotion of good service from a performance management, human resources, and learning perspective. 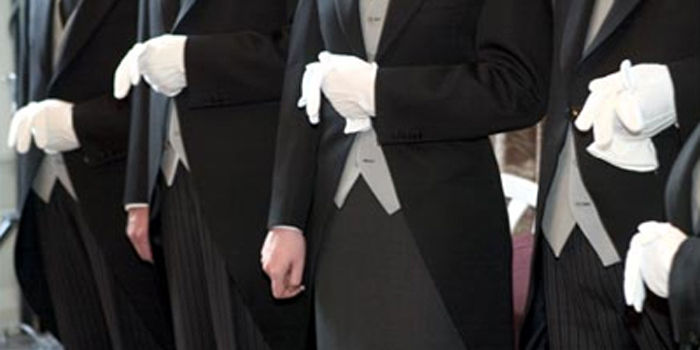 The Help: Demand for Housekeepers and Butlers Is on the Rise - The Wall Street Journal. The trick to having it all: asking for help … and hiring a butler - The Guardian. Wanted: San Francisco butler to whip home into shape (salary: $175,000) - The Guardian. 'Whatever the price is, I’ll pay for it' - "Meet the mums who are too posh to parent." AMERICAN YACHT INSTITUTE - specialize in training future professional staff. Bespoke Bureau - "The World's Best Household Staff." We're the leading Domestic Staff Placement & Training Agency of Butlers, Housekeepers, House Managers, Private PA, Chauffeurs, Domestic Couples, 5 star Hotel Staff, Cabin and Yacht Interior Crew. London's leading high-end domestic staff agency with the world famous British Butler Academy to boot. BUTLER FOR YOU - "International Household Staff Agency." Crew Unlimited - "Established in 1983 in Fort Lauderdale, FL, has become known as one of the top yacht crew placement agencies in the world. Finding yacht jobs and travel jobs on luxury charter yachts, private yachts, and estates, in popular cruising areas such as the Caribbean, the Mediterranean, the Bahamas, the US North East, for Captains, Chefs, Mates, Engineers, Steward(esse)s, and Deckhands, all around the world, is our expertise!" Eden Nannies & Maternity Nurses - "One of the leading providers of private childcare in the UK and overseas." Ellie Blu Agency - Miami, Palm Beach & New York. "Working Hand in Hand With You." Childcare & Household Staffing. FLOATING LIFE - "Crew selection and management." With the Owners' supervision, Floating Life provide the Captain with constant assistance and support in selecting, managing and training each member of the crew in order to ensure that the Owners are 100% satisfied, allowing the sea staff to grow professionally. GREYCOAT PLACEMENTS - "Setting the Standard in Recruitment." We offer a uniquely personal service – no other agency can offer as much. We know that it is the people that make the difference so if you are looking for Household or Estate staff, Childcare staff or Catering and Hospitality staff either in the UK or Internationally, we aim to deliver results. hampton domestics - "Licensed and Bonded Domestic Placement Agency serving NY, Palm Beach, Miami and The Hamptons." Hemisphere Crew Solutions - specialist crew recruitment agency for the luxury Superyacht industry, offering bespoke crew searches, headhunting services along with generic recruitment to ensure the right crew are placed on the right yacht. HILL ROBINSON - "Crew selection and recruitment." Finding and keeping good crew is critical. Hill Robinson will take care of your crew selection and recruitment using our advanced HRcrew database. HOME STAFFING NETWORK International - "Mutual Satisfaction Is Our Goal." A home is an expression of our personality and creativity, the place that ideally brings us peace and pleasure. Maintaining your home can also be the aspect of your life that takes up much personal time and energy, and finding the right people to assist you can be a challenge. The Home Staffing Network is at your service! IMPERIAL RECRUITMENT - "Imperial Recruitment is the largest domestic recruitment agency supplying staff for all domestic situations throughout the UK and abroad." INTERNATIONAL YACHT CREW - "The 'In' Yacht Crew." LUXURY ASSETS - "Staff Placement with Integrity". An elite recruitment agency for private household staff and family offices based in London and Zurich, operating only at the highest level providing an unrivaled service for clients as well as candidates. Luxury Yacht Group - "Professional Yacht Crew Placement." Luxury Yacht Group recruits more yacht crew each year than any other company. With 17 dedicated crew placement coordinators we have the largest and best trained staff in the industry to help guide your job search. Nanny & Butler - "Private Childcare & Household Staff Agency." Leading global Bespoke Search Consultancy. Based in London and Rome we are the leader in the placement of Childcare and Household Staff. With many years of experience we are able to provide you with a complete bespoke service offering you quality placements that will match your specific personal requirements. PAVILLION AGENCY - since 1962. "The Leader in the Field of Personal Service." Pavillion has taken great pride in staffing the world’s most distinguished homes. PEARL PERSONNEL - "Pearl is a brand new concept in recruitment with a truly global presence, bringing you the best choice of candidates from our ever-expanding data base which comprises the most attractive talents for front desk positions in hospitality, office support, beauty & spa, retail and onboard superyachts." Polo & Tweed - since 2013. "Domestic Helper Staffing Agency." We are a luxury domestic service recruitment specialist based in London, who raises the bar in recruitment. British domestic staff are considered to be the best in the world at service. If you are looking to recruit the perfect staff please get in touch: Butlers, Nannies, Maternity Nurses, Housekeepers, Chefs, Security, PAs, Estate/House Managers, Domestic Couples. Savoy Butler Service - "Celebrating 125 Years." The Savoy has long had an ethos of ‘personal service naturally’, and was the first hotel to establish its own school to train professionals.The Savoy Academy trains a new generation of butlers who combine the discretion of a traditional English butler with the efficiency of a 21st century personal assistant. THE CREW NETWORK - "The world's premiere crew agency." With offices positioned in key yachting hot spots, The Crew Network is ideally placed to assist you in finding the perfect yacht crew. Having offices in Fort Lauderdale, Antibes and Viareggio gives you access to the best quality crew at all times." 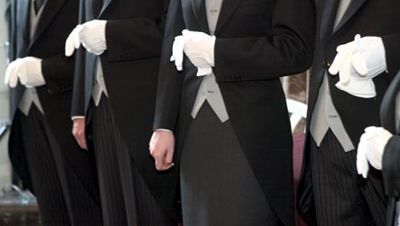 THE GUILD OF PROFESSIONAL ENGLISH BUTLERS - "The Guild of Professional English Butlers has been training hotel butlers for the past fifteen years. The training provided by The Guild covers, theory, practical and role-play in the areas and situations that a hotel butler has to deal with in their working day." The Help Company - "The Help Company is the BEST agency to provide families and individuals with the utmost in domestic, family and personal care services available. Los Angeles, San Francisco and New York." Also offers you a premier list of consultants to train your domestic staff. Your house will run like a five star hotel in areas such as laundry, cooking, housekeeping, etiquette, and organization. THE INTERNATIONAL GUILD OF PROFESSIONAL BUTLERS - "The World's Finest Private Staff." Our Services include recruitment & training of Private Staff such as butlers, household managers, personal assistants, chefs, couples etc. THE LADY - "For elegant women with elegant minds." Britain's longest-running weekly women's magazine. It has been in continuous publication since 1885 and is based in London. It is particularly notable for its classified advertisements for domestic service and child care. YACHTCHEFS.COM - "By Chefs For Chefs!" Chef recruitment for yachts.